This past Friday, we ventured back out into the bitter cold evening for another Gallery Stroll in February. --- Got to respect those who braved the freezing night to walk around downtown Salt Lake City and the outer reaches for some artwork in what was a unique display all around. 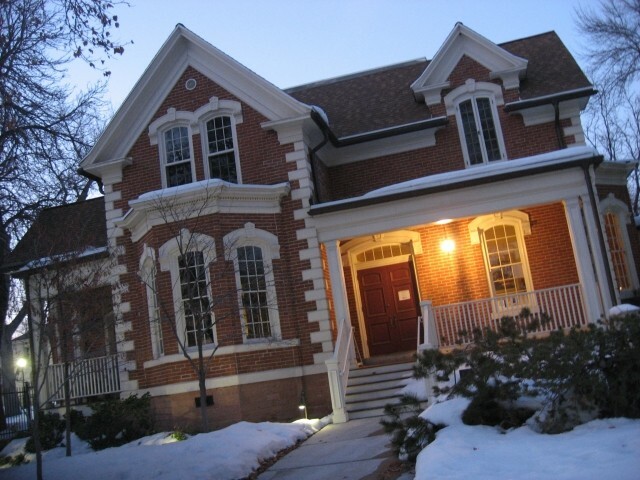 This month, I made my way over to the Alice Gallery, located at 617 E. South Temple in the Glendinning Home, a former residential home and dentist office until the state bought the home and made it the office of the Utah Arts Council. This month, the gallery showcased three artists, including our old friend Jethro Gillespie, who had some of his newest works on display. Today, I chat with the other two of the artists, Rebecca Pletsch and Andrew Ballstaedt, about their careers and art, as well as showcasing everything hanging on the walls, which you can check out in this gallery here. Gavin: Hey, Rebecca. First thing, tell us a little bit about yourself. Rebecca: I grew up in a large family in Provo. I am of German descent, from which I think I have inherited a mild case of OCD and am a perfectionist with my work. Because of this, my taste also tends to lean more toward modern and clean lines. Rebecca: I knew I had a gift for it from an early age. In elementary school, I won several competitions for it, but I didn’t take it too seriously. I was gifted in other areas and wanted to pursue something more practical. It wasn’t until college that I actually decided to become an artist. Early artists who influenced me: I loved the dark moody painting of Rothko; the geometry of the modernists; Albers and Mondrian; the Bauhaus and how they all relate, I think, back to the geometry found in the classical compositions of the Renaissance. I also loved the painterly painters Sargent and Monet, who could describe a water lily with a single brushstroke. 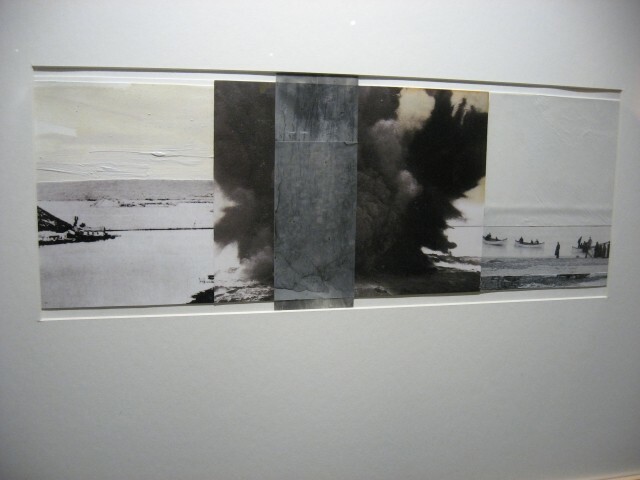 My favorite exhibition I think I’ve ever seen was a series of prints Motherwell did to the poetry of Raphael Alberti. Alberti was one of the Spanish 27, and as a boy, he had wanted to become a painter but was convinced instead he was meant to be a poet. So, he wrote all this poetry about art, line and color instead. 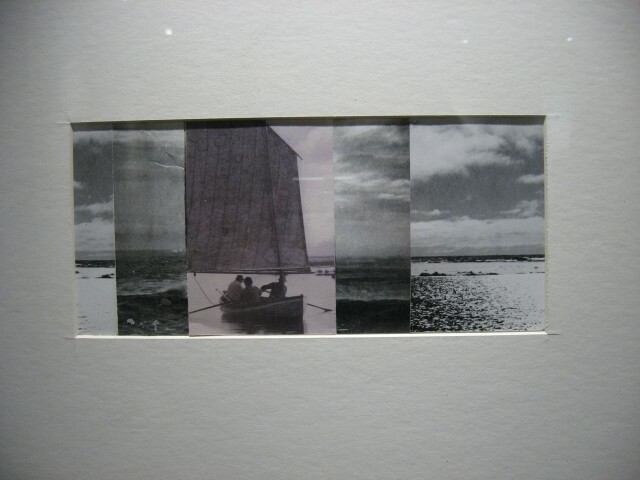 Motherwell did prints to coincide with some of his poetry. One piece was a print of a swath of deep black and the poem next to it was, “The personae of light. Unmask. Still the blackness looks out of your eyes.” Another piece was white with lines and its poem was, “My childhood: A Whitewashed rectangle; wet quicklime and the joy of my shadow that prints it alone.” They were strikingly beautiful. Along with the exhibit was a movie of Motherwell during the process of printing. He was expounding on art theory while haphazardly smoking an ashy cigarette over the colors of ink they were printing with. While he did this, the printmaker, with his spotless apron and white gloves, looked on in terror. It was hilarious and illustrated the fundamental difference between painters and printmakers. And I loved Motherwell after that. Gavin: You received your BFA from Brigham Young University in 2002. What made you decide on BYU, and what was your time like there? Rebecca: I actually started at BYU with the idea of becoming an industrial designer. I had a sister in the design program so I decided to follow in her footsteps there. As I was taking the beginning classes, though, I had professors keep telling me that I should switch over to art, and deep down I knew it was what I was meant to do. Eventually, I just gave into it. After I switched over, I was behind every one else in the program. All the students there had been studying art for years, and I had to catch up fast. Figure-drawing class was the most terrifying for me. I was a slow draftsman and I had never drawn a full figure from life before. And all of a sudden I was expected to do it in three hours or less. I would get there, be scared out of my mind, draw furiously for three hours and then go home exhausted, but eventually, I caught up. And the professors there were great. Gavin: During your time there, what drew you toward painting, and what made you decide to make it your emphasis? Rebecca: I liked the immediacy of painting, and the expressive brushstrokes you can get with oils. I tend to be an emotive painter so the process is linked to what I want to express. Gavin: What was it like for you branching out into the local art scene after college and taking part in exhibitions? 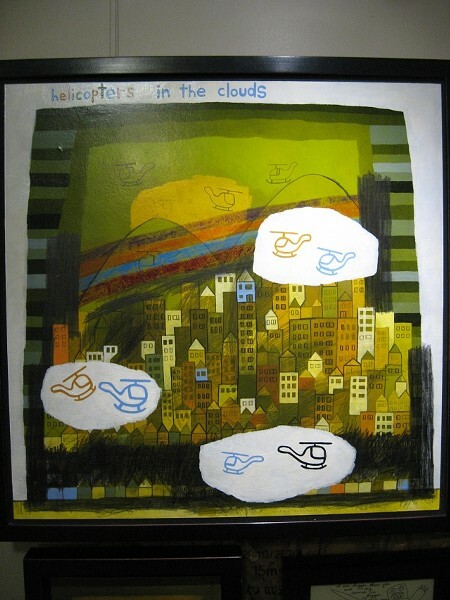 Rebecca: After college, I started entering juried art shows, which are always kind of hit-or-miss, but getting into galleries wasn’t as hard as I thought it would be. I think the biggest challenge is always just making good art, and if you can do that, everything else falls into place. 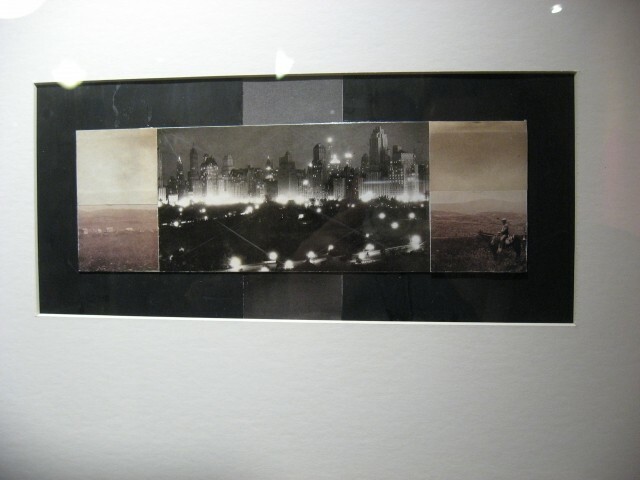 Rebecca: I am inspired by photographs I’ve taken or pictures I look at. Usually, an idea will come to me for a painting. The ideas come almost as a snapshot of a finished painting. From there, I try to sketch out what is in my head. And take photographs if needed to reference. 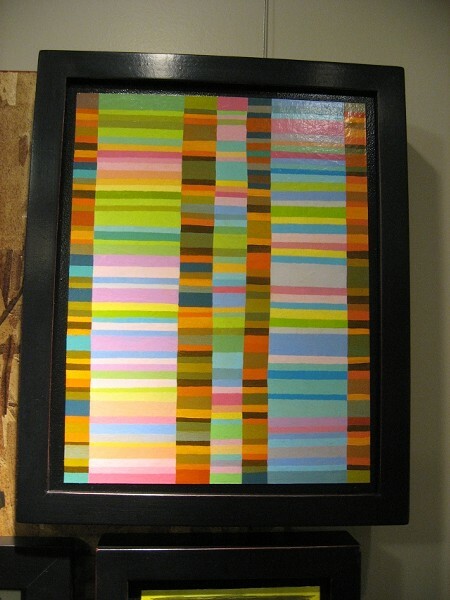 Then, I make small paintings to explore what colors or balance I want in the piece. I like to use classic composition techniques as the base of my paintings. So, I also lay those on top of the sketches or image and see how they fit in. After I sketch it out and figure out the composition and colors I want to use, then I move on to the real piece. It would be nice if I got every painting done on the first try, but usually, I end up painting a piece four to six times before I get it right. That is the nature of it, though. Sometimes, you can’t see what the right line is until you put the wrong one down, and sometimes, you can’t see what the right color is until you put the wrong one down. I think when you are starting a piece, often there is a fear of failure; I’ve had to learn not to become paralyzed by that. I think failure is a huge part of success. The faster you try, fail and learn from it, the faster you can move on to success. Gavin: While you showcase your work around the state, you primarily keep a lot of your shows in Utah County. How is it for you promoting your work there and helping that part of the scene thrive? Rebecca: It is a smaller art scene so that makes it a little easier, I think; though in the beginning, it was harder. %uFFFDThere used to be only a few galleries and public spaces for showing your work here, but as the years have gone by, there are more and more spaces and the community is more and more supportive of it. 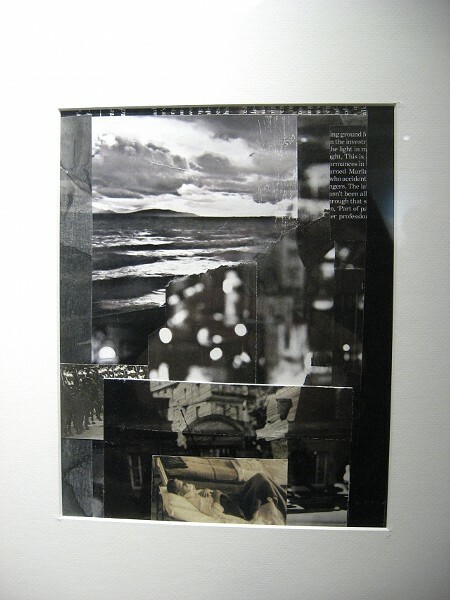 Gavin: What got you interested in collage work and what was it like for you breaking into a new art form? Rebecca: One of my advisors in college was the famous printmaker Wayne Kimball. He made me start doing collages in a little book as a way to work through compositions and ideas faster. At first, I just did it because I had been told to do it, but then I became more and more interested in it. I like the idea of these pieces of magazines ads or photographs that serve as visual record of our lives and society that exist for a moment and then they are discarded. I love old documentary photographs. Of particular interest to me are the indistinguishable figures in documentary photographs that suggest the idea of the everyman or universal archetype. From them, I seek to create new narratives and explore the ideas of journey, memory, time, as well as the contextual symbols of light, darkness, order and chaos. The thing I like most about collage is that it is so unpredictable. With a painting, I have it planned out from beginning to end, but with the collages I never know what kinds of things I will find. Usually, I will get about halfway through one and become stuck, not knowing how to end it. It can then take me months to find a solution by looking through the mountain of material that I have for inspiration and I am almost always surprised by the outcome. 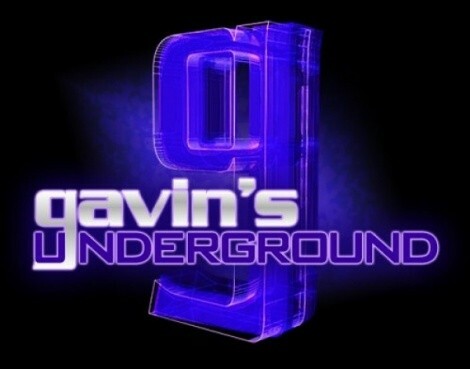 Gavin: You've been exhibiting here for over a decade. How have things changed for you as an artist from when you started to where you are today? Rebecca: Things around me have changed a lot. I think there are so many more spaces to exhibit, and the support of the local government and communities has improved. There is more access to art online, and you can even make your own prints and sell them if you want where; before, that would have been impossible. 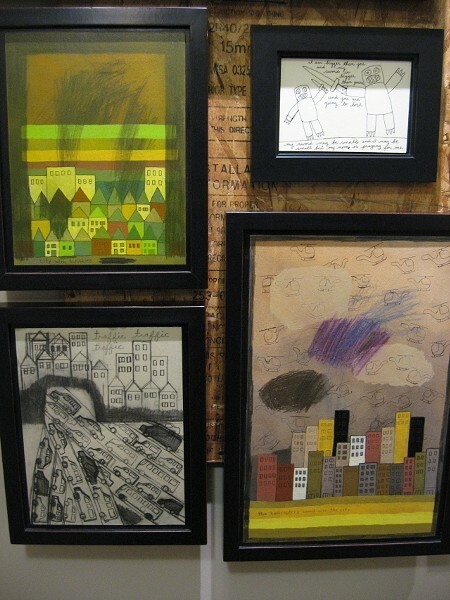 Rebecca: There are paintings and collages on display for the exhibit. The collages are black-and-white modern retakes or reinterpretations of some older paintings by Abbott Thayer and Alfred Cheney Johnston. 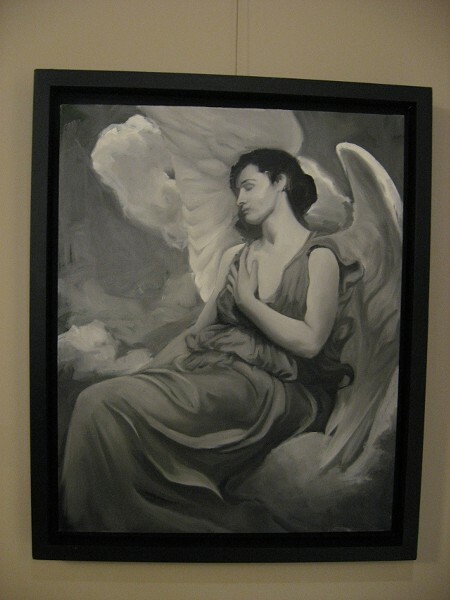 They are portrait studies and are meant to be kind of a jumping-off point for a larger body of work I am working on of idyllic and angelic black-and-white figure paintings that I will show in the near the future. 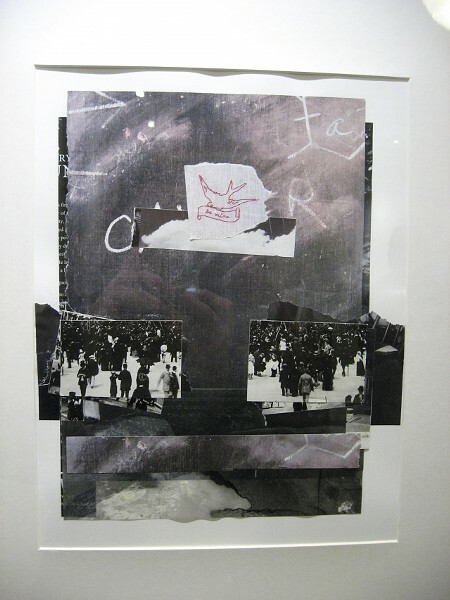 The collages are figurative narratives and are black-and-whites, as well. Over time, my work has become less and less saturated, and more and more I find myself drawn to black-and-white. I like black-and-white because it is so quiet, almost piercing. The stillness is enveloping. In his book Concerning the Spiritual in Art, Kandinsky equates both black and white with silence, and then he went on further, explaining the feeling surrounding the colors. Of white, he said it is great silence, like an impenetrable wall, shrouds its life from our understanding. This world is too far above us for harmony to touch our souls. White has the appeal of the nothingness that is before birth, of the world in the ice age. And of black, totally dead silence, it is represented by one of those profound and final pauses, after which any continuation of the melody seems the dawn of another world. Black is something burnt out, like the ashes of a funeral pyre, something motionless. Beyond the color theory attached to black and white, there is also rich history of symbols attached to them that I like to play with, as well. Gavin: How has it been for you working with Alice Gallery for this showing? 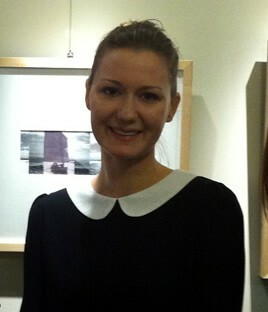 Rebecca: It has been great working with the Alice Gallery. 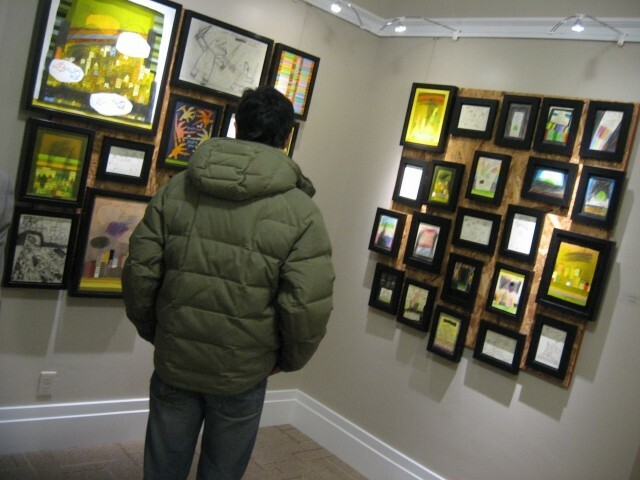 The Alice Gallery is run by the Utah Division of Arts and Museums, and once a year they accept proposals to have group shows of local artists. In general, the Utah Division of Arts and Museums is so supportive of us as local artists. Gavin: Going local, who are some local artists you like checking out or recommend people should look for? Rebecca: There are so many. I like them all. Rebecca: I love the Gallery Stroll. I think it has such a great vibe and its a great excuse to get out on a Friday night see some art with some friends. And invite friends who maybe wouldn't normally go out to see art. It carries a great sense of community with it. Rebecca: I am working on a larger body of work of idyllic figures and angels in black and white to which I may add some seascapes and collages. I am also working on some night scenes, streets at night. Hopefully I will finish one or both bodies of work and exhibit them this coming year. Gavin: Hey, Andrew. First off, tell us a little bit about yourself. Andrew: I am the sixth of 12 children. We grew up Mormon. My mom and dad treated art almost as a sacred part of our lives. I often heard my dad say how children were the best artist; I make art today because my parents valued art and encouraged art in our home. I grew up hearing my mom's story of how as an elementary girl she had wanted to be an artist but her teacher told her she was not a good artist so my mom quit art. In a way that was the best thing that happened to my mom because she knew exactly what not to do when she taught her kids art. We had so many kids in my family that we didn't have a lot of extra money but we did draw a lot. My parents could always afford to turn on music and have us kids gather around the table and color and listen to books and music. My mom and dad wouldn't get mad at us when we scribbled on the walls; they said they could buy new paint and repaint the walls someday but they could never get back in time and get us to be kids again. An almost sacred memory was when mom would have all of us siblings sit down and draw together. Five of my siblings majored in art at BYU. Art was just something all of us in the family did; kind of like in some cultures where the mother teaches her children how to cook, my mom turned on music and told us to draw. 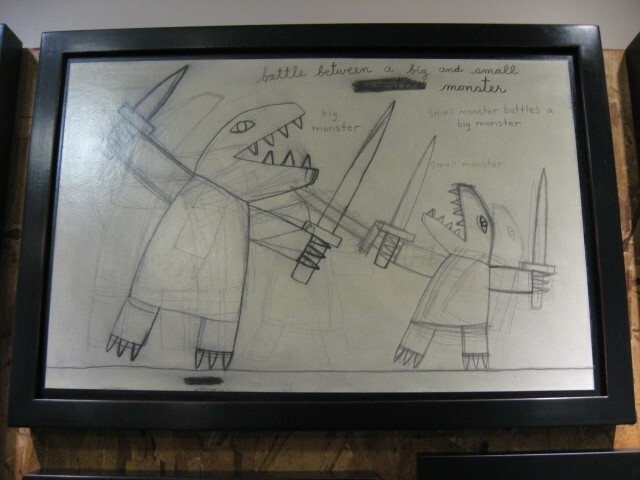 Drawing and making art was part of my culture because my mom loved it when we drew and she valued what we drew. She saved all my childhood drawings and I have them all saved in drawers. Andrew: My dad told me a story of being in church once and a man was teaching the Sunday school lesson and got teary eyed because he was explaining how he had to spank his young son because he had found scribbling on his son's closet walls. My dad raised his hand in the class and made the comment to the teacher that that is probably why none of your children are artists. To my dad, if you spank a kid when he draws on the wall then he is going to subconsciously associate drawing as bad. My mom kind of represented the passing on the culture of making art to me and my siblings, and to me my dad represents the nonconformist figure, where he encouraged me to go against the grain and study art instead of doing business, law, or medicine. I grew up with him telling me the story about Robert Frost - -which I don't know if it is true story or not -- but my dad loved the moral of the story: that Robert Frost's dad offered him $20,000 to not be a poet and Robert Frost rejected the money and became poet anyway. My dad passed on the idea to me, paraphrasing from the Bible, that does it matter if you gain the world if you lose your soul? To my dad, if you took the money instead of following your passion of poetry or art, you would be losing your soul. That is a very different message I was receiving than many of my friends. In college, one of my friends came downstairs and saw me painting and he said to me that my dad would get so mad if he found me painting in the basement that he would tell me to go get a job and stop being lazy and wasting time. Andrew: In my early college years, my dad was the opposite voice that was telling me to do art instead of business. He may have inspired in me a desire to be a subtle contrarian. My dad is fiercely stubborn and loyal to the idea that children are good and gifted artists and are often ruined by well-meaning adults. We would often have philosophical conversations about how we should follow our passion. When I got home from my LDS mission, my dad told me I needed to take some time and be lazy, which was very different to what I had been doing as a missionary, where I was supposed to be busy all day working. I think my dad was teaching me a good lesson that often ideas and creativity have to be allowed to be nurtured through day dreaming and play, which is often seen by the world as "lazy." Andrew: My parents are the reason I had the courage to study art and continue making art, but I had several art teachers along the way who made me feel like I was a wonderful artist -- who sometimes may have even used self-fulfilling prophecies and believed in me more than my art work deserved, but I think the best art education is a type of cheerleading like I saw in graduate school from David Pagel, an art critic in Los Angeles who was also my teacher at Claremont Graduate University in Southern California. I think there are so many things working against people who want to be artists that I very much value a cheerleading and encouraging approach to art education. One of the best things I learned at Claremont was from a teacher named Michael Reafsnyder. Michael makes very serious, thick, abstract paintings, but sometimes has a sense of humor, like when he puts a smiley face in a serious abstract painting. In a critique with Michael, I was nervous to show him an illustrative painting I had done.The painting was of monster crocodiles coming out of the ocean with a castle sinking. He said something I will never forget: to make art that makes me happy to be alive! Art is too hard when I am trying to make things that I think will be good or that I think people will like. I am happiest when I am making art that makes me happy. Gavin: You received your BFA from BYU back in 2006. What made you first choose that school and and was the experience like in its program? 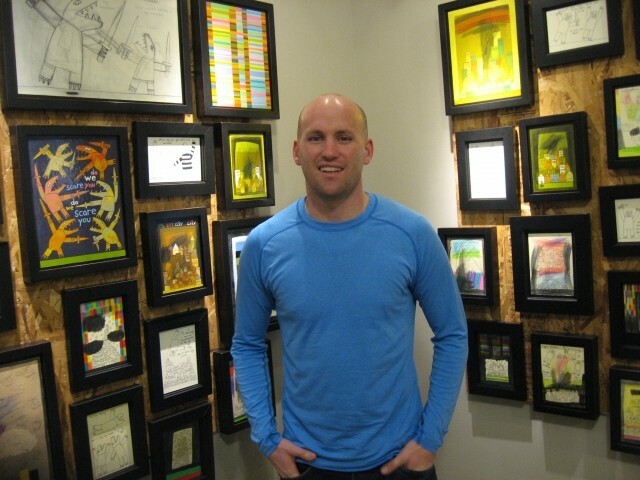 Andrew: I had a wonderful experience at BYU, doing a BFA in studio art and getting a K-through-12 teaching certificate. When I started, there was a new teacher there nameded Peter Everett who had just gone to Pratt in New York and gotten an MFA. I remember listening to him talk about his experience getting an MFA out of the state of Utah and being challenged by his professors and having one professor tell him she hated him because he painted the figure. The idea that a teacher could be so passionate about art and hate someone because they painted the figure fascinated me and I dreamed of getting my MFA out of the state of Utah, too. As I worked with Peter, he introduced me to many contemporary artists and I saw many of his students go to prestigious graduate programs like, Pratt, Chicago Art Institute, and UCLA. Peter brought many interested contemporary artist to BYU, like Shazia Sikander, Berry McGee, John O'Connor, Lisa Sanditz, Allison Miller and many others. As I listened to these visiting artists and met with them in studio visits, I was so excited to discover the world of art outside of Utah and I will always be thankful to Peter for encouraging me to go to graduate school out of state. Going to Claremont was life changing for me. Two people who helped me appreciate local art in Utah are Joe Ostraff, BYU professor, and Brian Kershisnik, a regional Utah artist. 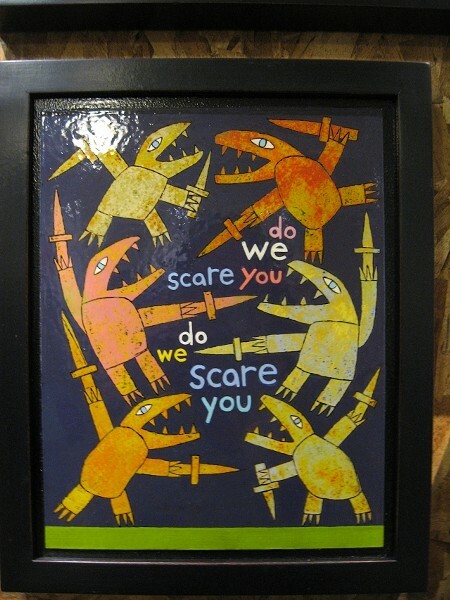 Joe told me once that he was involved in a group art show through an art organization in Utah. Some of the artists in the group show were a little pretentious and hard to work with and were upset about where their work would be placed in the show. Joe told me he decided to take a kind and humble approach to the show organizers and told the organizers that he would be happy no matter where they placed his art in the show. 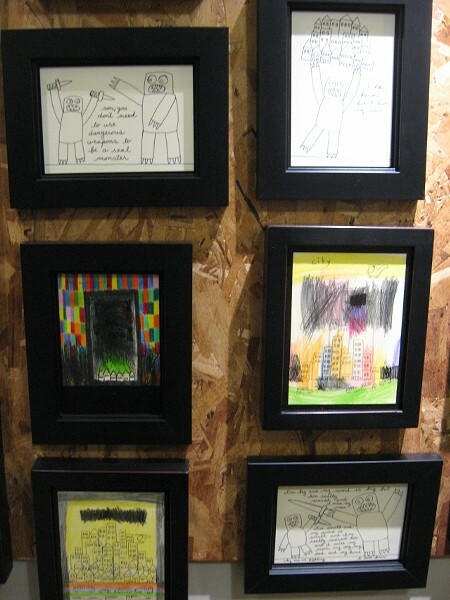 Joe's work ended up being placed in the best and most visible spot in the show. While at BYU, Joe taught me an important lesson about collaboration, about the importance of being humble and easy to work as an artist. Gavin: You eventually moved on to Claremont Graduate University for your MFA in 2010. Why did you switch colleges and how did your time at Claremont differ from BYU? Andrew: When I graduated from BYU, I went to graduate school to get my MFA In southern California. Near the end of my first semester at Claremont, I had a bout of anxiety and it affected me so much that I dropped out of graduate school for three years. During the three years, I met some good friends named Brian Kershisnik and Fidalis Buehler, a BYU art Professor. At a time when it was hard for me to leave my house because of anxiety, they were kind to me. Brian invited me to work on some projects with him in Kanosh, and Fidalis invited me to work on some projects in Springville. Their friendship helped me overcome some of my anxiety and more appreciate and value being a part of the local art in Utah. When I went back to Claremont to finish my MFA, I took a puppy with me. This dog is named Zeus and is a standard schnauzer and e is almost 4. My dog helped me overcome my anxiety and finish graduate school. He is now becoming a service dog for me and he wears a service vest when I teach art classes as an adjunct professor at BYU. The main thing I learned when I went back to Claremont after my three year break with anxiety was that I should be fiercely loyalty to myself and stubborn to make the exact art that I wanted to be making. Back at Claremont in 2009, I made a decorative football painting just because I wanted to and hadn't had the courage to make it back at Claremont in 2006. I often try to tell my current students that if they are not painting or making exactly what they want to be making that they need to re-evaluate what they are doing and find the courage to do exactly what they want to be doing. Andrew: When I went back to Claremont for the second time, I was overcoming anxiety and trying to finish graduate school. I remember driving on the 57 freeway in Orange County and the traffic was crowded and fast and I was fighting anxiety and a painting title came to my mind: "The scary storm - the real scary storm." I then went to my studio and wrote the title at the top of the page and drew the scary storm I was feeling. It was a raw and honest painting, and many of my professors and teachers were drawn to this painting. It doesn't always work, but I often have titles and phrases come to my mind and I like to write them on the painting. It makes more sense to me to write the title right on the page. If it is really part of the painting or artwork, why would I only put it on the title card? Title cards get lost. This practice of writing my titles on my paintings has also developed from my friendship with Brian and Fidalis, who also use text and titles in some of their works. 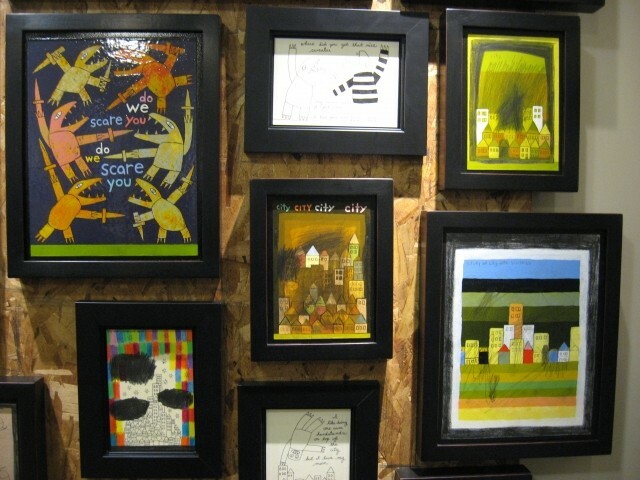 Gavin: Once you had your MFA, what was it like for you breaking out into the local art scene? Andrew: One of my goals is to show in Los Angeles, but I think it is also important to be a Utah artist. I love Utah and embrace Utah. My great great great grandpa was Brigham Young. Utah is part of my culture. I think all artists like audiences and want to be famous. I am no different. I am trying to make a living as an artist. I am lucky to be showing at Meyer Gallery in Park City. Susan Meyer is incredible. She reminds me of David Pagel, who would encourage all my ideas when he was my teacher at Claremont. Susan is one of the better gallery owners I have ever met. She has the confidence to allow her artists to try almost anything they can think of. She lets me do large abstract paintings, and monster paintings, cities burning, monsters going on dates, and she encourages me to try new things, like making sculptures. As an artist, it makes me want to work harder for someone like Susan who encourages creativity. I wasn't selling much for her in her gallery, so I asked her if I could do an installation of, like, 60 small paintings of monsters and cities. I had seen an installation by Barry McGee and wanted to copy his idea. Susan allowed me to try this installation, which isn't very common in a commercial gallery. It took a lot of extra work on her part to make it work but I was able to start selling small pieces, which directly led to me selling a large 6x4-foot abstract painting. She allows me to try and do exactly what I want to do with my art, which sometimes leads to good things; sometimes it doesn't, too. Failing is important. I am working on an art-drawer furniture series that hasn't worked out, but Susan keeps being patient with me and allows me to explore ideas. She is an excellent gallery owner. Andrew: Working with the Utah Art Council and Alice Gallery has been very delightful. They have been kind and provided wonderful refreshments for our show. It has been an honor to work with them and I hope to find more opportunities to be a part of the Salt Lake Gallery Stroll. Andrew: Greg Caldwell is a local artist who I admire. He makes pottery and drawings and is has a great work ethic and is very kind. Also, Caitlin Connolly, Daniel Everett, Allan Ludwig, Cole Walker and Kev Nemelka. 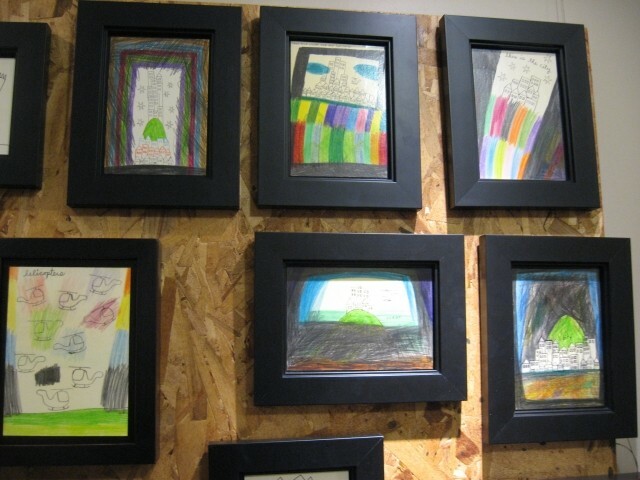 Andrew: This year I am hoping to make at least 100 art pieces and make at least one book of my art. Andrew: My website; a short film about me made by local film maker Christ Cutri; a short Film about me made by local filmmaker Steve Olpin on his YouTube channel thetalkingfly; Meyer Gallery in Park City; 100 Artspace, the collective traveling one-night art shows where everything is $100 or less happening March 1; Greg Caldwell; and a good local affordable framer, Rick Shorten at 801-616-8533.